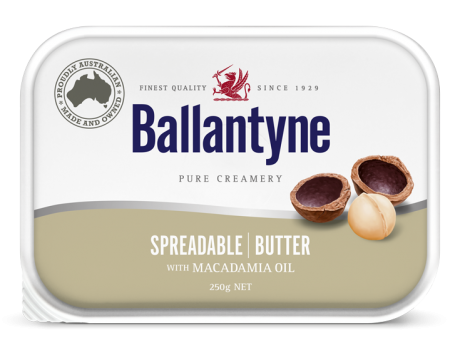 Native to Australia’s sun-drenched north, the Macadamia nut brims with essential vitamins, minerals and oils. 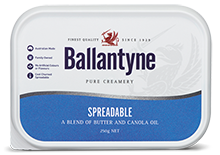 But don’t choose this versatile butter blend just for its natural goodness; the creamy, nutty taste is also irresistibly delicious. 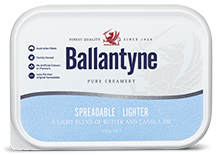 Spread it on golden hued toast—with or without your favourite jam—or to add scrumptious extra flavour to savoury sandwiches and baked snacks. 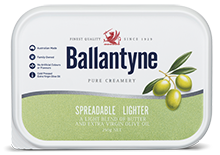 Butter (min 40%), water, macadamia oil (min 12%), canola oil, salt, preservative (202). Contains Milk and Tree Nuts. May contain traces of Peanuts & Sesame seeds.